The Goose Man Fountain (Gänsemännchenbrunnen) in Nuremberg is located at the Town Hall Square in the Old Town. No other fountain in Nuremberg can lay claim to so many copies. In Nuremberg alone there are two Gänsemännchenbrunnen. These fountains have many admirers, most famous of whom were Johann Wolfgang von Goethe and King Ludwig II. 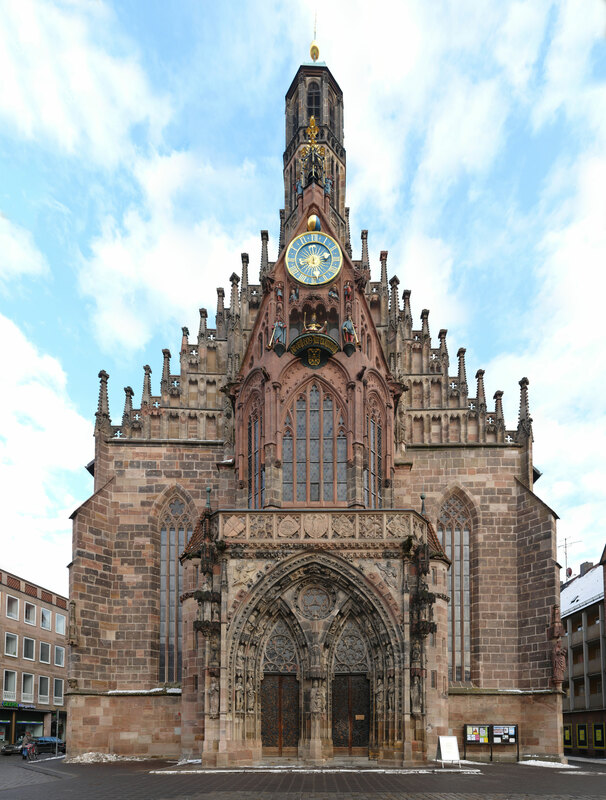 The fountain sculpture was cast in 1550 by Pankraz Labenwolf, designed by Hans Peisser, and probably commissioned by the Nuremberg City Council. The sculpture depicts a farmer from Nuremberg’s agricultural area, known as Knoblauchsland (garlic country), who is carrying a goose under each arm. Contrary to what some believe, it is not Hans im Glück with these two geese. According to legend, the man is a fashionably dressed 16th century peasant who is carrying his geese to market for the purpose of selling them. On the way to market the geese sensed what awaited them and began to loudly squawk. Softened by the geese fear, the farmer took pity on his animals and took them back home. This bronze fountain sculpture stands on a pedestal in the middle of a granite, calyx-like fountain bowl and is surrounded by a Renaissance wrought iron grid. The goose beaks act as water spouts. Originally the fountain was located at the square behind the Frauenkirche (the church in the Main Market Square), which used to be the Goose Market. Today this square is known as the Fruit Market (Obstmarkt). The present location of the Gänsemännchenbrunnen was chosen during the reconstruction period after the World War Two. The other fountain in Nuremberg with the Gänsemännchen figure was produced at the art foundry Lenz and is located at Wilhelm-Spaeth-Strasse 47. A linden wood model of the figure can be seen in the City Museum Fembohaus. Johann Wolfgang von Goethe visited Nuremberg four times and, on his last visit in 1797, had an impression of the fountain sculpture made and sent to his address in Weimar. For Goethe, the small sculpture embodied 16th century German art. In addition to the many replicas of the popular figure in private gardens, King Ludwig II (the king who built Neuschwanstein) also had a replica made for the Hohenschwangau Castle. Additionally, there is also a Gänsemännchenbrunnen located in Lucerne, Switzerland. Learn more about Nuremberg by taking the Nuremberg Old Town Walking Tour offered by Nuremberg Tours in English.